One of the top US auto maker Ford introduced refreshed 2013 Taurus SHO at the New York Auto show. 2013 Taurus SHO has same engine as the earlier model and it has same 3.5 liter twin turbo Eco Boost V-6, now with an estimated 365 horsepower. It produces a torque of 475 Nm. A six speed Select Shift auto with steering paddles does transmission duties. Larger brakes and a torque vectoring control, which uses limited application of individual brakes to enhance cornering, are added to the all wheel drive setup. It also got performance package which is said to improve the car’s performance prowess and it includes sport tuned suspension and a Track Mode setting. 2013 Ford Taurus gets a few face with trapezoidal high intensity discharge headlamps and black mesh grille. A fender mounted scallop with SHO badge and 19 inch wheels can be seen on the sides. Interiors of the vehicle includes leather wrapped steering wheel, leather trimmed sport seats with embroidered SHO graphics, unique woven aluminum trim and adjustable aluminum pedals with memory. MyFord Touch graphic user interface which replaces some of the easier to use knobs and buttons with a touch screen is also equipped in this model. The electronic steering system has been tuned and stability control now has a track mode. 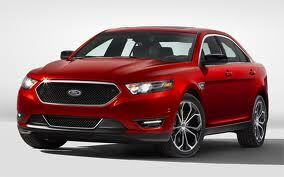 The revised 2013 Taurus SHO, like the mainstream Tauri will be coming for the sale in next spring. The base price is likely to remain just under $40,000.